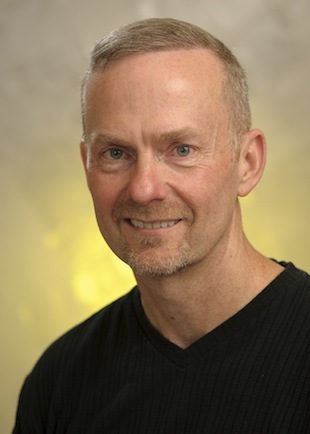 Roger Hunter, NASA Kepler Project Manager, spoke at Chicago’s Adler Planetarium on July 2, 1013 about the spacecraft’s phenomenally successful search for exoplanets. Although Kepler suffered a gyroscope1 failure on May 11 (which may end Kepler’s ability to collect data), Hunter stated that Kepler’s biggest discoveries likely are still to come. 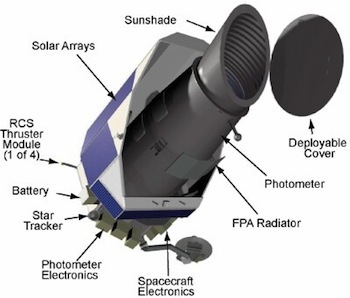 NASA’s Kepler spacecraft is a 0.95-meter space telescope design specifically to measure tiny decreases in light from distance stars — decreases caused by an exoplanet orbiting and passing in front of a star. To emphasize Kepler’s ability to detect minute changes in brightness, Hunter explained that if Kepler were in Earth orbit, it could detect a flashlight on the moon being turned off and on. As a result of Kepler’s discovery of a multitude of extrasolar planets, Kepler has changed the way we think about the universe. While we used to imagine that planets might exist around the occasional star (if conditions were just right), we now realize that almost all star systems likely have one or more planets. And while we used to think planets could only exist in certain types of systems, Kepler has show us planets orbiting in binary (double) star systems, planets orbiting red dwarf stars, and even planets within densely packed star clusters. Hunter also shared some potentially good news about Kepler’s recent gyroscope failure. During the coming month, Hunter explained, NASA’s plans to try to restore the reaction wheel 4 gyroscope. NASA engineers have developed a recovery plan and will send test commands to Kepler which might restore some level of operation to reaction wheel 4. Hunter stressed, however, that the possibility of success is uncertain. Even if NASA’s upcoming attempts to restore Kepler to working order fail, however, that will not mean the end of discoveries made by the spacecraft. To date, scientist have only processed and analyzed data from approximately the first two years of Kepler’s mission,3 meaning that two more years of data remain. And Hunter expressed certainty that several major discoveries will emerge out of that remaining Kepler data. One major discovery likely to be made from the already collected Kepler data is the confirmed existence of the first “alien Earth,” according to Hunter. Such an Earth analogue would be an Earth‐sized rocky world orbiting within the Habitable Zone (where liquid water can exist) of a yellow star like our Sun. Hunter ended his presentation at the Adler Planetarium with a request for the young people in the audience. The Kepler spacecraft is in the same orbit around the Sun as Earth, but Kepler is orbiting more slowly than Earth.4 After 61 years, Earth will catch up to — and pass by — the Kepler spacecraft. Hunter asked that today’s youngsters make sure that their grandchildren recover Kepler when it next passes by Earth, bring the spacecraft back to Earth, and place it in a museum where future generations can learn about the role it played in showing humans that the universe is teeming with planets. Pingback: What's ahead in 2014 for Astronomy and Space Exploration?